5 Gallons- Perfect for Contractors and Commercial Use! 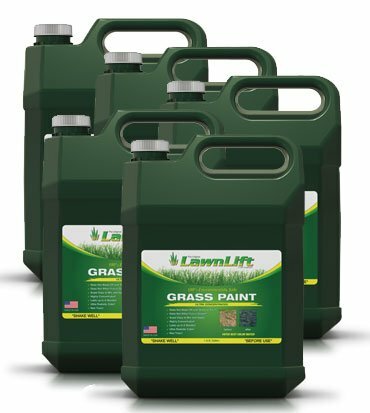 5 Gallons Ultra Concentrate Yields a minimum of 55 Gallons and covers up to 20,000 sq ft* LawnLiftTM is the "Original" All Natural, Non-Toxic and Biodegradable Grass & Mulch Paint. LawnLiftTM Grass and Mulch Paints are "Pet Friendly" and offer "The Best Color" in the industry! Unlike most other grass paint, we refuse to use inferior man-made and non-earth friendly pigments that result in a transparent blue/green color which makes grass appear un-natural. LawnLiftTM uses only "All Natural" true color pigments that have garnered us the best color in the industry! From small pet urine spots to entire dormant or dead lawns LawnLiftTM has you covered.... *Results can vary depending on dilution ratio and sprayer setting. Non Toxic... Safe for Children and Pets! If you have any questions about this product by LawnLift, contact us by completing and submitting the form below. If you are looking for a specif part number, please include it with your message. Lawnlift Ultra Concentrated (White) Grass Paint 1 Gallon = 11 Gallons of Product. 10,000 Sq. Ft 4Ever Green Grass and Turf Paint - Have a green lawn all winter long!